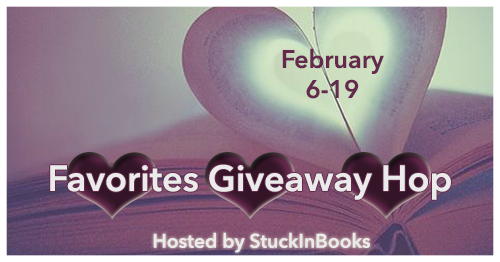 Enter this giveaway for a chance to win a book of your choice worth $14. Good luck! Little Women favorite from the first time I read it. My favorite books are The Tradf Street series by Karen White. It has to be Alice In Wonderland/Through The Looking Glass! My all time favorite book is The Stand by Stephen King. I read it at least once a year, I love it! Le Maudit by Myrielle Marc. My all time favorite book is The House by Danielle Steele. It gave me hope. Hmm tricky one but I'd have to go with Illuminae by Amie Kaufman! Can't wait for Dominic's book. My all time favorite book is Pride & Prejudice by Jane Austen. The Harry Potter books. Reading Sorcerers Stone was the first time I fell in love with a book. I would have to say A Prayer for Owen Meany is my all-time fave and the standard to which I hold all other books. Hard question. I have favorite books for different reasons. I'm going to say Twilight, it's what jump started my love for reading. Robin Hood and Peter Pan are my all time favorites. :) Thanks for the giveaway. I love Damon Suede's HOT HEAD! My favorite book is Wuthering Heights by Emily Bronte. That's a hard question!! I have a lot of favorites. Maybe KMM: Iced. I can read that over and over, anytime, anywhere. Well as everyone will probably agree on there are several favorite books and I can't just choose one. But one that I like reading over & over again is On the Island by Tracey Garvis-Graves. Thank you very much. I think my favorite so far is Shatter Me by Tahereh Mafi! Her writing style is just my style and so different. I like Jonathon Livingston Seagull. My all time favorite books are Fantasy Lover, Night Pleasures, Night Embrace, Dance With The Devil, Night Play , Unleash The Night, Acheron and Styxx. All by Sherrilyn Kenyon. Dollbaby by Laura L. McNeal, Every Fifteen Minutes by Lisa Scottoline, Kisscut by Karin Slaughter, Center of Gravity by Laura McNeill and The Sound of Glass by Karen White. I like the Stephanie Plum books by Janet Evanovich! My all time favorite is To Kill a Mockingbird. This question is always hard for me. I feel like it changes depending on my mood, but I'm gonna go with Boy's Life by Robert McCammon. It is hard to pick! Especially just one! I'd have to say It by Stephen King or Watchers by Dean Koontz. All time favorite - Anne of Green Gables. Harry Potter and The Goblet of Fire! My absolute favorite in that series, which just so happens to be my favorite of all time! Such a hard question, I love the Anne of Green Gables series. Also at the top Harry Potter, Hunger Games, Cold Mountain, The History of Love, and Alice's Tulips. very hard to say, I loved the what Katy did books by Susan Coolidge, but also Tim by Colleen McCullough, and child 44 by Tom rob smith to start with! Phew, you got me here. I really really like Tyrant by TM Frazier. I really am not a fan of this question... I feel like I am leaving out so many awesome favorites! But, when I do have to answer it, Harry Potter always tops the list! My all time favorite! That's hard. I'd have to say the first book in Tamora Pierce's Lioness Quartet. I love Agatha Christie classics like "And Then There Were None" and "Murder on the Orient Express." This is really hard because I have A LOT of favorite books. I would say Hush Hush and To All The Boys I Loved Before. The Lion, the Witch and the Wardrobe is the first one that came to mind. It's always hard to pick one favorite. A Prayer for Owen Meany or The Power of One. Thanks for giving. The Dark Hunter series by Sherrilyn Kenyon is my favorite, especially Acheron and Styxx. Harry Potter series is my all time favorite. The Lord of the Rings trilogy. I can read it over and over again and get something new out of it each time. My favorite book of all time is Long Way Down by Krista and Becca Ritchie. It's a book in my native language called Same Eyes. Mediator series, pride and prejudice, The forever Girl. Outlander by Diana Gabaldon is my favorite book, and has been for years. My all time favorite book is Snow Flower and the Secret Fan by Lisa See. Thanks. This time I'll say my favorite book is The Time Traveller's Wife. All time favorite is Harry Potter. I don't have one all-time favorite book. My favorites include Shadowfever by Karen Moning and Outlander by Diana Gabaldon. My favorite book is The Clan of the Cave Bear by Jean Auel. My favorite is Harry Potter and The Deathly Hallows. I also like Peter Pan, To Kill A Mockingbird and It.